Bootights are exactly what they sound like. 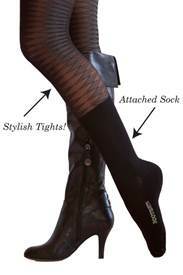 A pair of comfy, stylish tights with socks on the feet to keep you warm! They come in tons of different patterns and colours. They also come in two different lengths, for ankle boots or knee highs! I was lucky to be able to try these tights out. I struggled a little bit to get my foot inside, but after that first time I haven’t had any problems. They are super comfy, and great quality. I can’t think of a more perfect pair of tights for the winter or fall months. They come in a range of sizes (plus size too) and are available in Canada at www.bootights.ca Happy shopping!